With this post, we are entering the second step in kantei, following the traditional approach indicated at the very beginning of the series (i.e. sugata → jigane → hamon). As mentioned back then, the steel – jigane (地鉄) – allows us in the ideal case to identify the area of production and/or the school. Well, things are of course fluid, that means everything from so “featureless” that it is even hard to tell if kotô, shintô, or shinshinto to a very characteristic steel or forging structure that allows you right away to name the smith who made the blade is possible. This brings us to the point where I have to mention that the chapter jigane actually consists of two chapters, that is to say the already mentioned steel, the jigane, and the forging structure, the jihada (地肌), or short just hada. Before we start, we have to address a crucial point when it comes to jigane, namely the polish. Depending on factos like the age of the polish, the skill of the polisher, and the use of various ways to finish the ji, the appearance of the jigane can vary greatly, even if you are comparing two indentically interpreted blades from the same smith side by side. So my tip is, try to focus on what should be recognisable regardless of the finish of the polish, and that is the density and the pattern of the forging structure. Well, this tip does not work when the polish is too old or bad, and if you can’t see any details in the steel, you have to skip this step anyway. Rule of the thumb is: The more uniform the jihada, the better the skill of the smith. That means a jihada might be mixed with areas of different forging structure but these areas should never stand out in an unnatural manner. So if you have a blade with a tight hada all over that shows very coarse, rough, or inhomogeneous structures just in one area, you can assume that this was not intended, i.e. that the smith lacked skill. Another possibility is that you recognize areas that don’t show any visible forging structure at all or areas without a visible forging structure that are surrounded by rougher, standing-out areas. If so, it is very likely that the core steel (shingane) comes through and that the blade had seen some polishes in its life. Please note that certain similar appearances might actually be characteristic features of a certain school or smith but this will be pointed out below or in the individual chapters. A quality feature that mostly goes hand in hand with the uniformity is the fineness of the hada but that does not mean that a larger structured hada is of a lesser quality. In other words, a swordsmith was “embedded” into his scholastic background what means that a Yamashiro man followed a different approach in forging than a Sôshû man. So the outcome, i.e. the degree of uniformity and constant quality speaks for the skill of a smith and not the technical approach in general. So first of all, let me introduce the standard terms that have become established to refer to the different appearances of the jigane and the jihada. Basically we use the prefixes ko (小) and ô (大) to say if a forging pattern is noticeably smaller or larger strictured respectively. For example, an itame-hada can appear as ko-itame, as itame, or as ô-itame, that means here it got common to refer to a medium-sized forging structure just by its name and not to as by the prefix chû. There are of course schools of thought, like for example at the Hon’ami school, where they explicitly speak of a chû-itame or chû-mokume but today, most drop the prefix chû in this respect. Apart from distinguishing between a ko, normal-sized (chû), or ô forging structure, we also speak of a fine or dense hada, in Japanese komakai (細かい) or tsunda (詰んだ). Or also terms like seibi (精美) are in use to refer to a hada that is very fine and beautiful. Well, I am aware of the fact that there are subtle differences between a “fine” and a “dense” hada but I don’t want to overcomplicate it for the moment. The opposite of a fine hada is a rough (arai, 荒い・粗い) or standing-out (tatsu, 立つ) hada. That means in such a case, the individual layers of the steel are clearly visible. Again, a “rough” hada is not the same as a “standing-out” hada as the former term is more used to describe an “unnaturally” rough hada and the latter to refer to something that was intended by the smith, i.e. a result of his approach in forging the steel. Besides of that and not addressing the forging structure but the steel itself, we also speak of a strong (tsuyoi, 強い) jigane when the jihada is very visible at a glance and accompanied by plenty of ji-nie. A strong jigane is usually associated with blades made in the Sôshû tradition where the large amount of ji-nie and chikei result in very present features. The opposite of that is a weak (yowai, 弱い) jigane where the jihada is hardly visible and shows no or only very little ji-nie. Basically, and with the exception of certain schools (e.g. 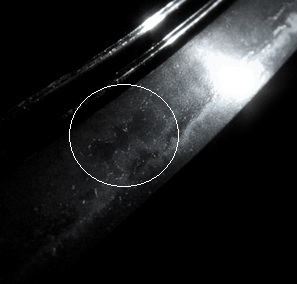 the Kiyomaro school that revived the strong Sôshû jigane), shinshintô blades are described as having a weak jigane as not much is visible in their steel. But there is more when it comes to describe the appearance of the jigane. The steel can also be either clear (saeru, 冴える) or subdued (shizunda, 沈んだ) whereas in the latter case we also speak of a “dull” or “cloudy” (nibui [鈍い] or nigotta [濁った]) jigane. Dull or cloudy means that a steel remains to be matt in larger areas even if polished. Or in other words, even if it is tried to enchance the ji with certain polishing methods, a dull or cloudy steel will never turn out to be super bright. And when the steel looks “wet,” i.e. kind of moisty even if perfectly freed from oil, we speak of uruoi (潤い). And last but not least we distinguish between a noticably dark or blackish (kuroi, 黒い) or whitish (shirake, 白け) steel. The former is typical for blades from the farther north or south regions, that means from the so-called Hokkoku region (北国, production sites along the Hokurikudô) or Kyûshû respectively. Accordingly, also the term hokkoku-gane (北国鉄) is in use to refer to a darker, “northern-style” jigane. As for shirake, basically later Mino, i.e. Sue-Seki blades are known for showing much shirake but a little shirake is seen at many other schools and this will be pointed out in the individual chapters. By the way, shirake is often a way to distinguish offshoots from the schools they came from. That means, if you have for example a blade that looks like Rai at a glance but that just shows too much whitish shirake in the ji, think about a school that derived from Rai, e.g. Enju or Ryôkai. And the overall quality of the work should tell you how far away you are from the “real thing,” i.e. are you facing a direct student of one of the great masters? Or is the workmanship already that inferior to assume that it is a work of a student of this student or of an even later smith from a local offshoot? In direct continuation of talking about the steel, I want to introduce first the features, the hataraki that can occur in the jigane before introducing the different forging structures. Well, strictly speaking, some of them might be associated with the jihada but they should be introduced here too for reasons of clarity and convenience. ji-nie (地沸): Ji-nie is probably the most common feature in the jigane and seen to some extent in any sword. As the term suggests, we are talking about visible martensite particles (nie) that occur in the ji. Ji-nie can be pretty fine and evenly distributed over the blade or concentrate in certain areas and if these areas appear in a connected manner over a certain distance (or along the entire ji for example), i.e. in a way to recognize a certain “unity” or patch, we speak of a nie-utsuri (but please see section utsuri for more details on this term). As for ji-nie, the same rule applies as for the jigane, that means we speak of a high-quality ji-nie when it is fine and uniform or when it was deliberately applied, i.e. when for example a partially rough and accumulating ji-nie was the style in which the smith worked. Also we must distinguish between if a sword was intended as mere weapon or if there was a real artistic approach behind making that blade. So if you have a late Muromachi-era blade from one of the then sword centers that shows rough and unnaturally accumulating ji-nie, it is safe to assume that smith was just lacking skill. But if you have a shinshintô blade with a rough and unnaturally accumulating ji-nie that should somehow represent a work from one of the great Sôshû masters, the element “lack of skill” has a slightly different connotation. In other words, the smith might had been indeed very skilled but than Sôshû was not his thing or he just started to experiment towards Sôshû. So depending on what the intention of making a blade was we have here different standards of appreciation. Just one example, very rough and obvious ji-nie is “accepted” for the Satsuma smiths because this was their style. chikei (地景): Chikei are black gleaming lines in the ji that are basically layers of steel with a different, higher carbon content. So chikei follow the layer structure of the jihada and are virtually the same as kinsuji, just with the difference that they occur in the ji and not in the ha. As a rule of thumb: The more chikei are present the more it is likely that a blade was made following the Sôshû tradition of sword forging, i.e. deliberately mixing steels of different carbon content. Please note that there is also another way the term chikei can be used and that does not refer to layers of steel but to a hardening effect. In other words, it is used to refer to ji-nie that forms formations similar to mokume-like burls but which are not tied to the layer structures of the jihada. Well, some say that they actually are tied to the layers and we are speaking here of the same thing, i.e. the former explanation of chikei used to refer to the “obvious” layers of different carbon content in the steel and the latter to much finer layers which are not recognizable for the naked eye as layer structures and thus seem not to be connected to the structures of the jihada. But I don’t want to split hairs here (the subject of chikei might fill a blog entry itself) and when I refer to chikei, I mean black gleaming lines in the ji, period. (Please click on pic below to get a larger and clearer image). yubashiri (湯走り): Yubashiri are isolated spots or patches of ji-nie that remind of water droplets. They are similar to tobiyaki as they occur detached from the hamon but as they consist of nie and are not embedded into a cloud of nioi, they have a more transparent look and not so clear borders as nioi-based tobiyaki. Due to the fact they consist of nie, yubashiri are of course seen on blades that are hardened in nie-deki or at least with much nie. So they are similar to tobiyaki but not the same. Yubashiri often concentrate along the habuchi and create there more linear appearances that remind of nijûba. We see them on Kamakura-era Yamato, Yamashiro, or Sôshû works or at later blades aiming at such works. jifu (地斑): Jifu are areas where ji-nie occurs as a “closed mass,” i.e. as patch or stain. For example, we find descriptions like “plenty of ji-nie that tends to jifu in places” what basically means that these areas full of concentrated ji-nie give the blade a spotted appearance. But the term jifu, lit. “spot/splotches on the ji,” is rather ambiguous and different scholars use it to refer to different features. For example, some refer with it to areas of exposed shingane, for which in turn the special term ji-zukare (地疲れ) exists. And the “showing through” (sunda, 澄んだ) shingane in turn resulted in the creation of the term sumigane (澄鉄) or sumihada (澄肌). Another term for the same feature is, in special context of the Aoe school, namazu-hada (鯰肌) as these patches remind of the slimy, scaleless, smooth and dark skin of a catfish (namazu). And also the term Rai-hada (来肌) is in use when it comes to Rai blades with this characteristic feature. In other words, these terms were born from the necessity to name similar features differently depending on which school it occurs so that you have a more sophisticated nomenclature to work with. In a nutshell, when someone talks about “dark spots in the ji” it might be difficult to know what is meant but when this person uses the terms namazu-hada, or Rai-hada, everybody knowns right away that he or she is talking about Aoe or Rai blades respectively. It is assumed that the feature sumigane, namazu-hada, or Rai-hada goes back to the fact that the corresponding schools made blades with a relative thin kawagane what exposes the shingane core steel rather quickly. Well, there is still discussion about if these features, or Rai-hada in particular, are exposed core steel or just inhomogeneous but in itself homogeneous and darker parts of the steel but from my subjective point of view, I think they might be shingane but with the difference that we are talking here about top quality blades what in turn leads me to think that even their core steel was of better quality and looks thus slightly finer when exposed and not at a glance like ji-zukare for example seen on a Sue-Seki blade. Anyway, this feature, i.e. sumigane, is also found on blades of the Un group (雲), the Enju school (延寿), the Mihara school (三原), of Osafune Motoshige (元重), and on early Echizen blades like for example of Chiyozuru Kuniyasu (千代鶴国安) and Hashizume Kunitsugu (橋爪国次). In conclusion it must be repeated that the jigane is a pretty sensitive subject and it needs some experience to be able to disregard or block out the condition of the polish and draw conclusions on what you would see with a perfect polish. That means certain features like yubashiri or finer ji-nie might just not be visible at an older polish. In other words, and this might make me sound like captain obvious, you should focus on what you see, i.e. you should not get lost in trying to figure out if a certain stain is yubashiri or jifu when the condition of the blade just does not allow such a conclusion. Also there are kind of preferences when it comes to judging Japanese swords: Some (like me) attach great importance to the sugata whilst others have a natural access to the steel and just need to look at the jigane and jihada to say which school or smith made the blade. And last but not least it turned out at our local sword meetings that light from a fluorescent tube is very good to see the steel (but not certain details of the hamon) but also sunlight does a pretty good job. In the next part (2.1) we continue with the different forms of jihada, followed by a chapter on utsuri, before we end part 2, the steel, and go over to part 3, the hardening. Once again – a great introduction for Jigane and invaluable for all our Kantei education. Many Thanks for providing and sharing. Excellent description of jigane and jihada.The best I’ve seen.